By the time this post appears on my blog the remarkable event it recounts will be over! Once upon a time the areas of Provence that are now famous for their lavender fields, where then famous for their almonds. 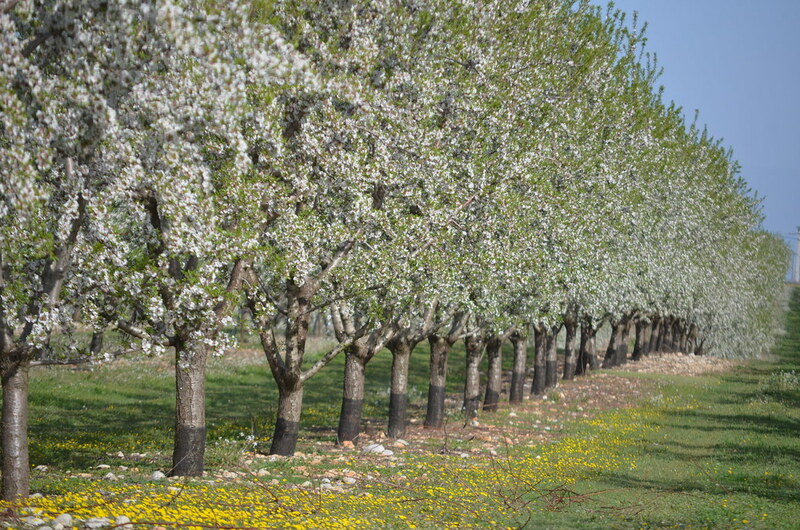 Indeed the main crops on the Valensole plateau were almonds and wheat, and the wheat was usually used for animal feed. 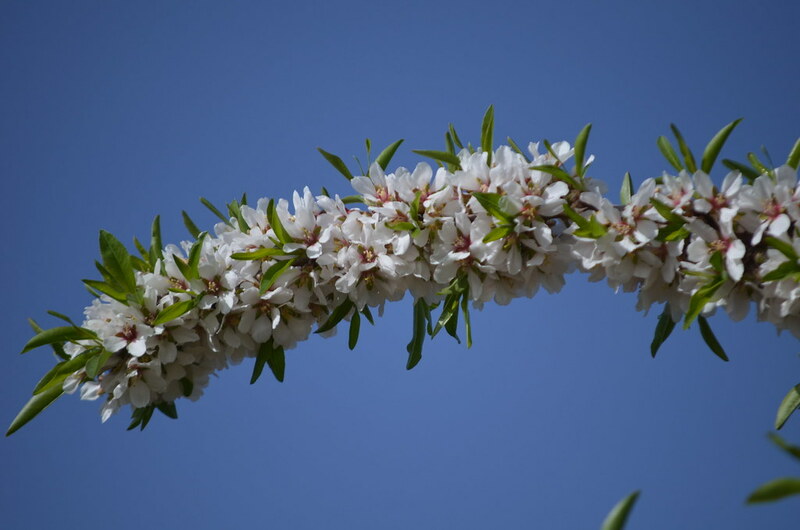 Growing almonds was a hard job however and climatic conditions and competition from abroad just to name those, soon put a stop to the almond trees and let the lavender take its place. If you take a trip to the Valensole plateau nowadays you will find that most of the lone trees growing amongst the lavender and wheat fields are wild almond trees, witnesses to the past when they were the kings of the land! 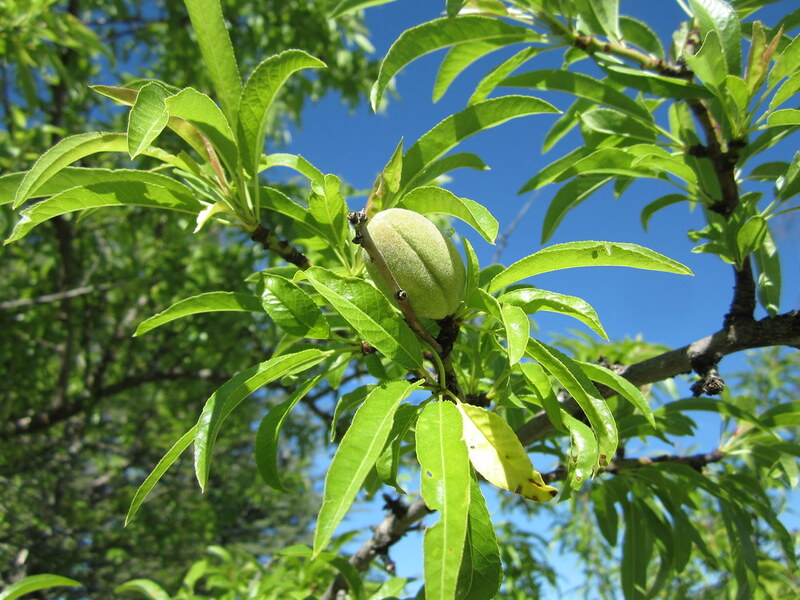 But times have changed and the almond trees are back. 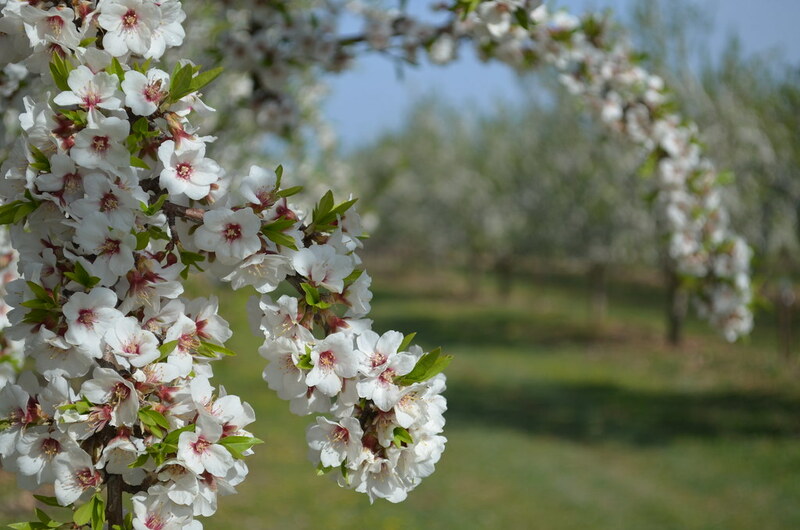 The harvest nowadays is used for essential almond oil and also for human consumption as the almonds are quite delicious, and when incorporated with local lavender honey the resulting nougat is something you won't forget in a hurry! 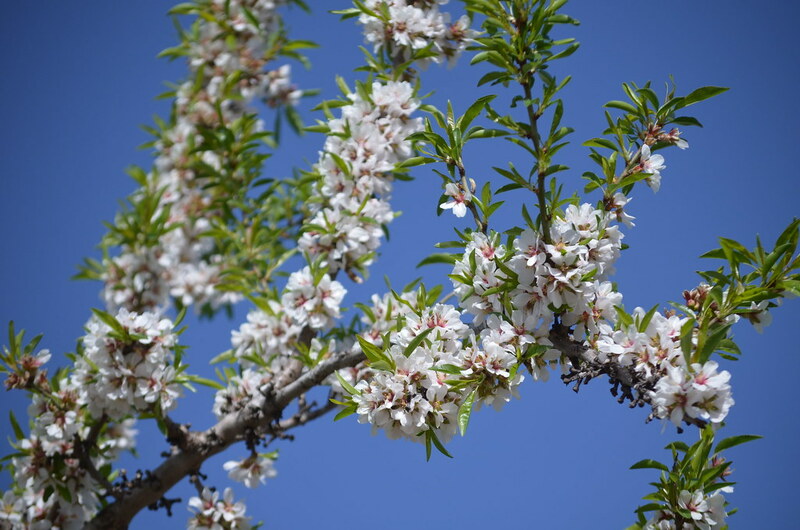 The essential oil is used in skin creams and one of the biggest clients is L'Occitane en Provence whose custom ensures the survival of the local harvest. 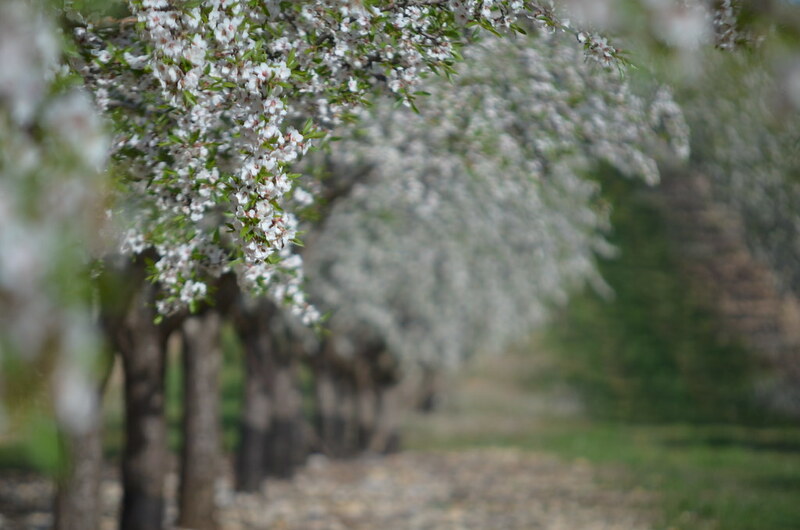 Below are a series of photos that can be found on our Flickr page of this years almond blossom. What is quite amazing is the scent given off by the flowers which smells of honey straight from the jar! Unique Provence is fast becoming a reference for luxury tourism in Provence. Not only individual clients through our blog and website but travel agencies around the world. Our guides have that personal touch that makes a trip special and our permanent on site research, of which you can read some of the results in this blog make us stand out from the crowd. Last year I went back to school to sit the exam in order to become a certified passenger transport company and we hired our vehicles or contracted other companies with vehicles to do our transfers and transport but all this has changed as of today! We are now the proud owners of our first luxury minivan with another in the pipeline for the coming months. 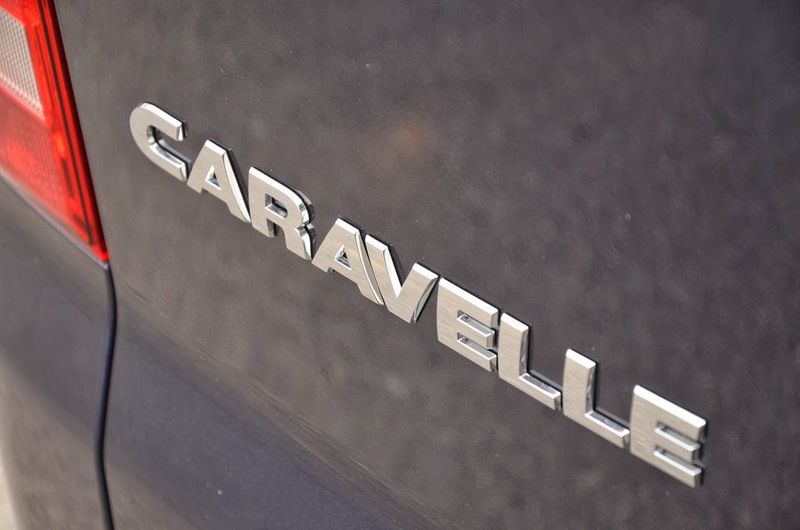 The vehicle we have chosen is a long wheelbase Volkswagen Caravelle with an all leather interior and tri zone air-conditioning. The 180hp engine and 7 speed automatic gearbox guarantee a smooth ride in all road conditions. 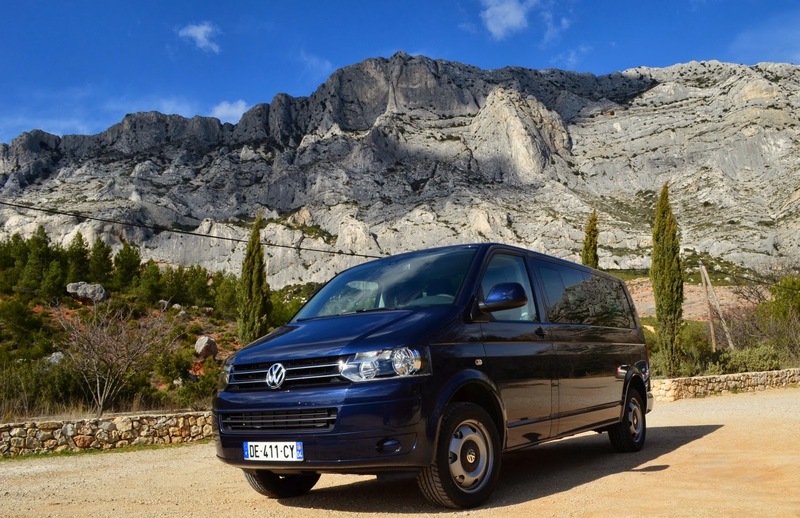 The other little detail that you will notice when we come to pick you up from your hotel or cruise ship is that our van is not black or gray like 99% of the other tour vans in Provence it's Navy Blue so still reasonably sober but a bit brighter all the same. 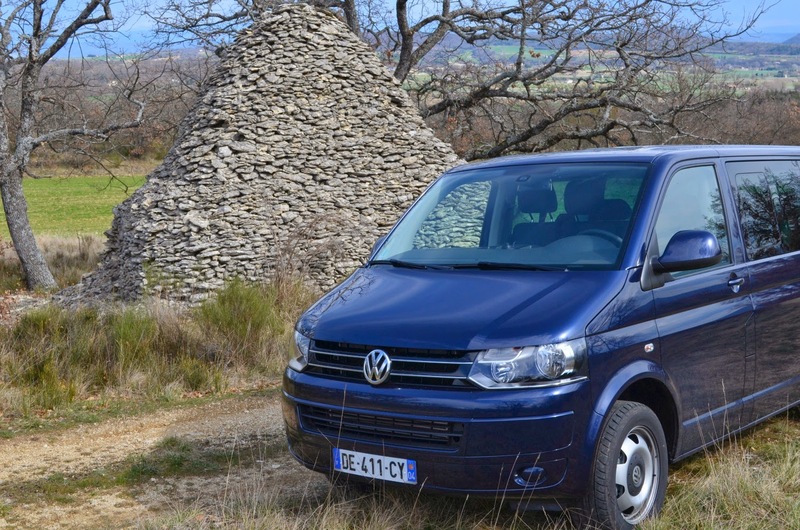 If you are interested in a guided tour in Provence whether it be for one day or for a week contact us using the link on the right, we would be delighted to show you our Provence in our nice new shiny blue van! The Lavender Endowment Fund website is up and running in English. The translation was done by me and so if you spot any glaring errors don't hesitate to post a message. The Decline of Lavender page was taken directly from my blog post article Provence Lavender Under Threat as the members of the board decided it explained the issue clearly. 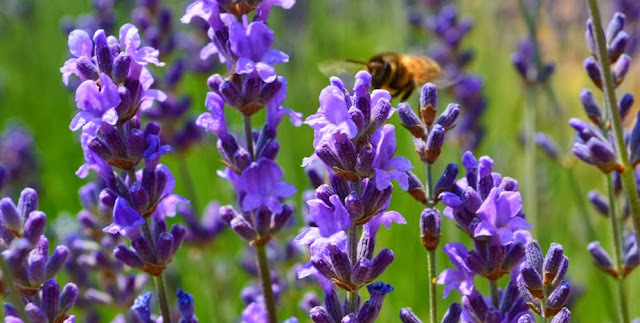 Please spread the word as Provence lavender needs help, the situation is not disastrous but it is not good either, and money is needed for research. For every lavender day tour offered by Unique Provence we will donate 50€ to the fund and every small group tour, 100€ per person, but you can donate by using the paypal link on the endowment fund website. I had to share this even if the photo isn't great. 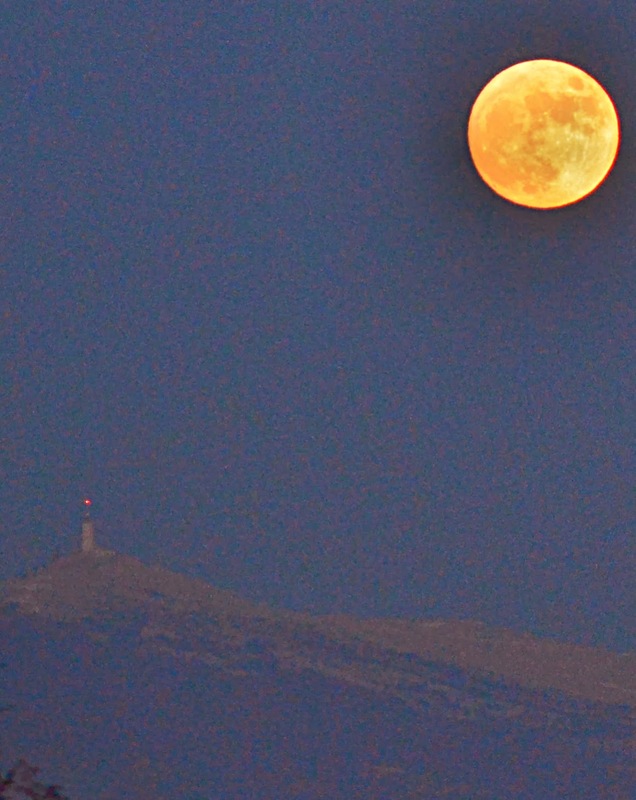 Last night I was driving home after seeing a client and happened to find myself faced with the amazing sight of the moon rising behind the Mont Ventoux as the sun went down, transferring the golden hues of the sunset to the moon. I was in my car in busy traffic and managed to get my camera out of its bag and put on my zoom lens and click out of the window. I didn't have much time to fiddle with many settings as the car behind was getting irate and the brief moment that you see in the photo lasted about 2 minutes before the moon lost its orange glow and rose too high. The photo is cropped to the essentials and allows you to imagine how stunning it was to see. 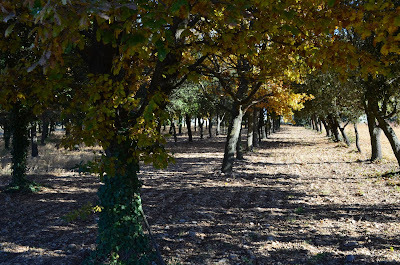 If you had planned your trip to Provence in the depth of Winter to visit monuments and enjoy wine tastings you may well go home a little disappointed. ...or at least that is how it may seem. 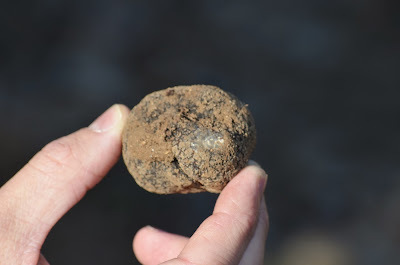 In fact there are some unique activities that can only take place during the Winter and the highlight of them all is the Truffle Hunt! 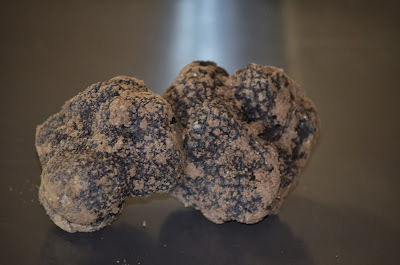 Of course truffles can be found throughout the year but the finest, most pungent member of this underground fungus makes its appearance from the month of December through to March, I am of course talking about Tuber Melanosporum or the Winter Truffle or as it is referred to in France "Le Diamant Noir", The Black Diamond. References to Truffles can be found as far back as ancient Egypt, where we know that Cheops served truffles to visiting delegations. The Greek Theophrastus (327-287 BC) thought that truffles were created by Autumn rains and thunder but it took several hundred years for his countryman Plutarch (46-120AD) to realise that it was water, earth and lightening that made truffles... Since then no new theories are mentioned so I'll stick with that one. Truffles where a common foodstuff in pre-middle age times they were plentiful and all you needed was a pig (a sow) to find them and nearby woodland, but with the increased power of the Catholic church the eating of truffles was soon stopped as the eating of a black object found underground and requiring a cloven hoofed animal to find it could only be the work of the devil. Luckily such superstitions where less adhered to in the Renaissance period by the likes of François I during whose reign the Truffle was returned to its rightful place on the table. At the time the Truffles on the royal tables originated from Burgundy, then from the South West of France and notably from the Perigord which gave them one of their names "La Truffe du Périgord". At the time truffles were still hunted for by Sows who apparently found the odour of the truffle similar to that of the sexual organs of a male pig. The fact that they have to be reigned in to stop them eating the truffle is either the indication of an extraordinarily amorous sentiment or that of pure hatred for their male counterparts. Whatever the case, with this new information in mind, next time you enjoy a Truffle Brouillade you can shine in society by announcing with authority the similarity to the senses of the truffle and a boars nether regions. 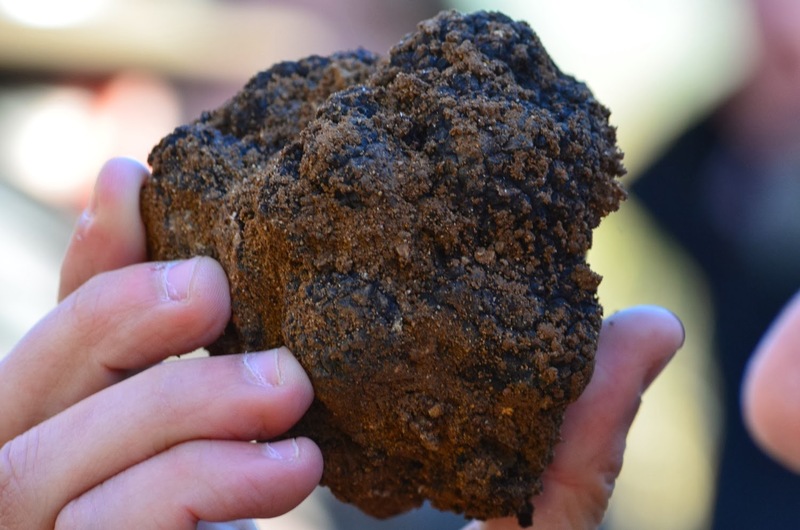 Modern day truffles are "grown", sort of. 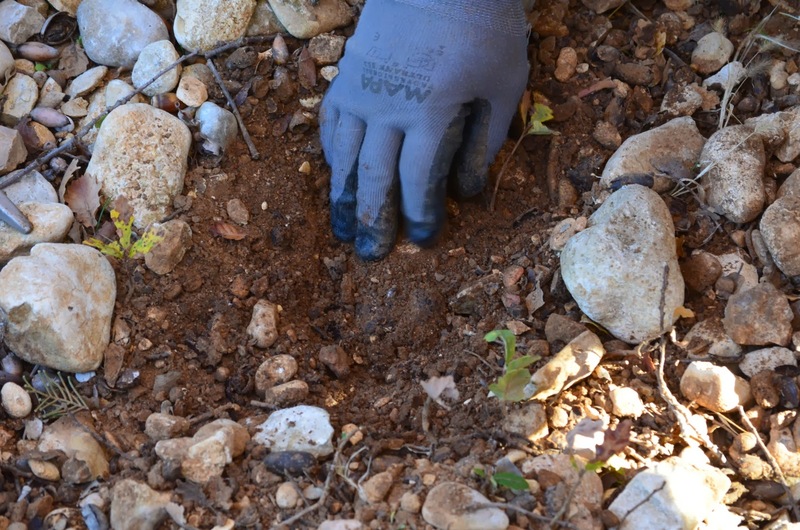 In 1810, a man called Joseph Talon from the village of Saint-Saturnin les Apt in the heart of the Luberon region of Provence discovered the connection with the truffle and the trees that they grew near, and it was this discovery that led to the development of modern day truffle farming. The technique consists of rubbing mashed up truffles into the roots of small oak trees an then planting them, actually it's a bit more complicated than that but that's the general idea. 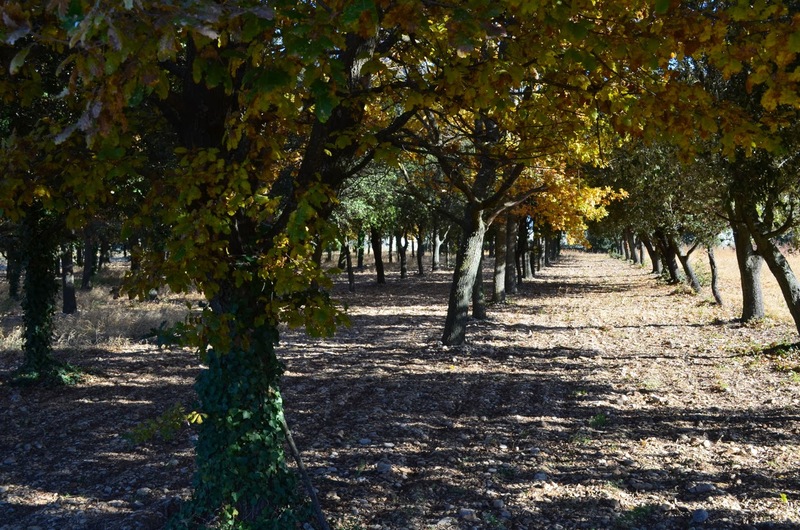 Truffle production in France in 1880 was 1320 tonnes, with 60% coming from the South East of France ie. Provence. Today those figures have dropped to a mere 30 tonnes with 80% coming from the South East and the rest from the Perigord contrary to popular belief. The reason for this decline is in part due to the massive toll of the First World War which basically wiped out a generation and in doing so not only took away the work force required, but also the link needed to hand down the information from generation to generation. The Second World War followed shortly afterwards and I personally think that a luxury item like a truffle was no longer a priority in war torn Europe. Nowadays dogs are used to hunt for the truffles as they are easier to control, and it is possible to go on a truffle hunt in Provence which is exactly what I did on Saturday with two travel agents from New York. We had a rendez-vous in the morning with Eric Jaumard who was welcoming a small group and had invited us to join them for the hunt. The day began inside with a bit of history (see above) before heading out into the truffle plantation with his trusty dog. 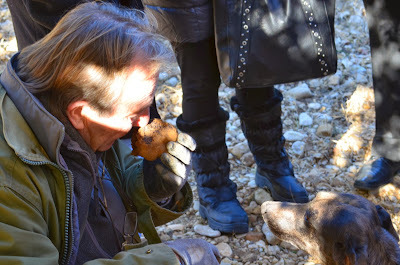 After sniffing one out and indicating the spot the truffle is revealed using a special pick axe. a big one this time! A couple of the best ones of the day. 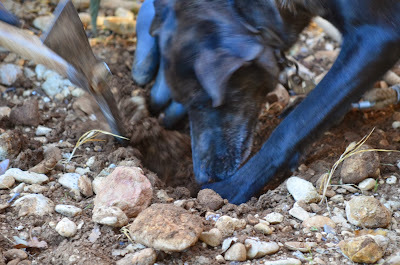 My assumption was that the dog would find a truffle or two and we would head back inside, especially as this is the the start of the season. But no! 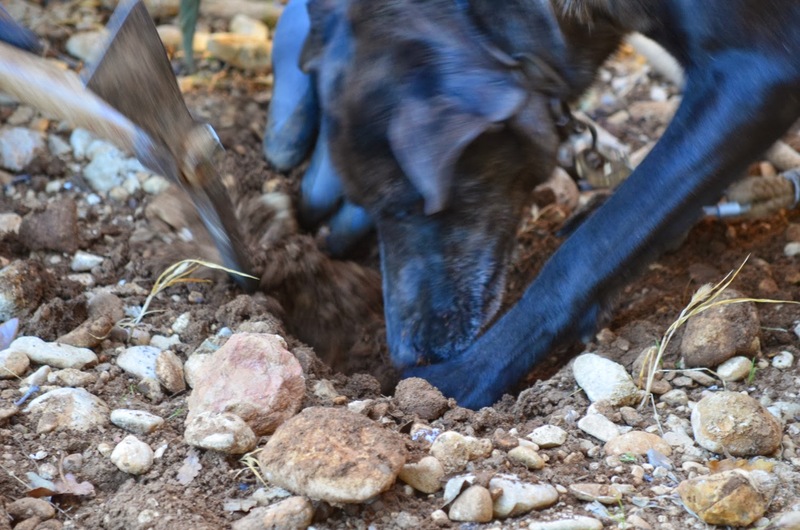 The dog, whose name I forget, was charging around and finding truffles with unbelievable regularity. Big ones and small ones were filling Mr Jaumard's bag and after an hour or so we returned to the farm with a pretty good harvest. From there we continued on our way to other discoveries whilst the group sat down to a truffle meal lasting much of the afternoon. 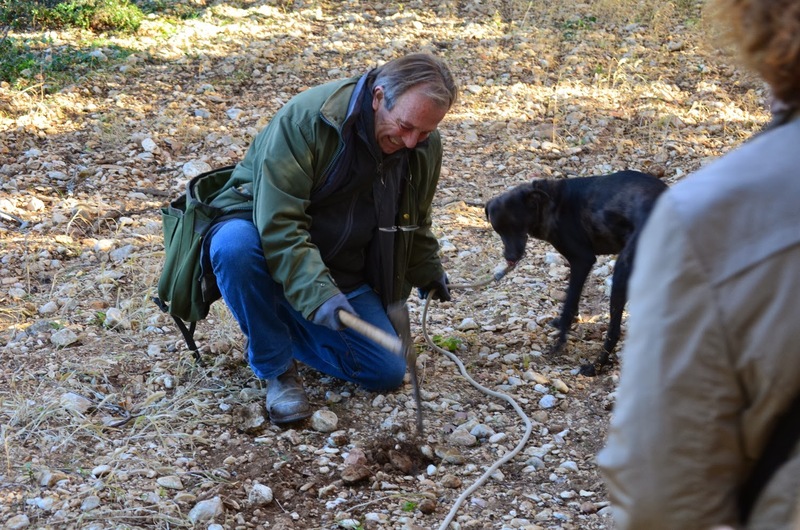 Of course if you would like to experience a truffle hunt followed by a meal, of cooking class we can create a made to measure experience for you. You can contact us using the link on the top right. The insect, a sap sucking leaf hopper, has a particular fondness for the taste of lavender upon which it lays its eggs. The insect and its larvae eat the sap of the plant which in itself would cause no problems, if eating a bit of sap was all they did, but unfortunately they are also the carriers of a phytoplasma, a bacterium devoid of cell walls and therefor dependant on a host, in this case the sap of the lavender plant. The insect is referred to as a vector, who much like a mosquito, drinks the sap from the plants and in doing so becomes infected and so propagates the phytoplasma to other plants. The phytoplasma in question here is the Stolbur Phytoplasma which also affects potatoes, tomatoes, maize and vines. Once the phytoplasma is in the plant it inhibits growth and eventually the plant becomes too weak to be productive or dies. So there, in short, you have the problem and the scale is huge. A noted rise in temperatures has also caused the proliferation of the insect and at this moment in time no effective solution has been found to eradicate it. Antibiotic treatment which would attack the bacteria directly, but their use on plants is forbidden in France to avoid the development of mutation and resistance which would only increase the problem. 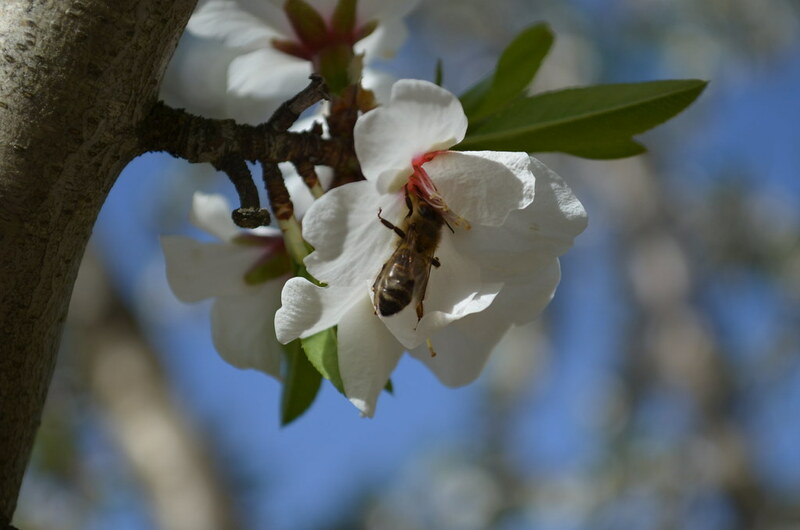 Chemical treatment in the form of pesticides would be almost impossible due to the fact that the larvae live under ground and the adults are present during the flowering season at the same time as honey bees. Also the use of pesticides is, from an ecological point of view, not possible even if it did work. I myself am a member of the board and the only representative of the tourism industry. The president is Olivier Baussan the founder of L’Occitane en Provence. The other members are mostly lavender producers. Through donations the foundation can continue its research into this major problem and as you can see is coming up with answers, but the solution to the problem is not in sight.